Teachers and staff, parents and pastor, work together to ensure that children are nurtured in a caring Christian environment. SFX&apos;s curriculum strives to meet the individual needs of your child in a changing society. Technology is integrated throughout the curriculum. Children develop a strong sense of moral direction now and throughout life. Students learn to observe and respond to others&apos; needs, and learn the value of compassion and cooperation. 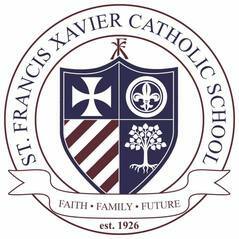 It&apos;s what the "Family of St. Francis Xavier" is all about!